Warby Parker was founded with a rebellious spirit and a lofty objective: to create classically crafted eyewear at a revolutionary price point. This New York based brand provides boutique quality, vintage inspired frames with prescription lenses for $95, and for each pair sold, a pair is donated to renowned non-profits who provide eyeglasses to millions of people around the world who don’t have access to proper vision care. 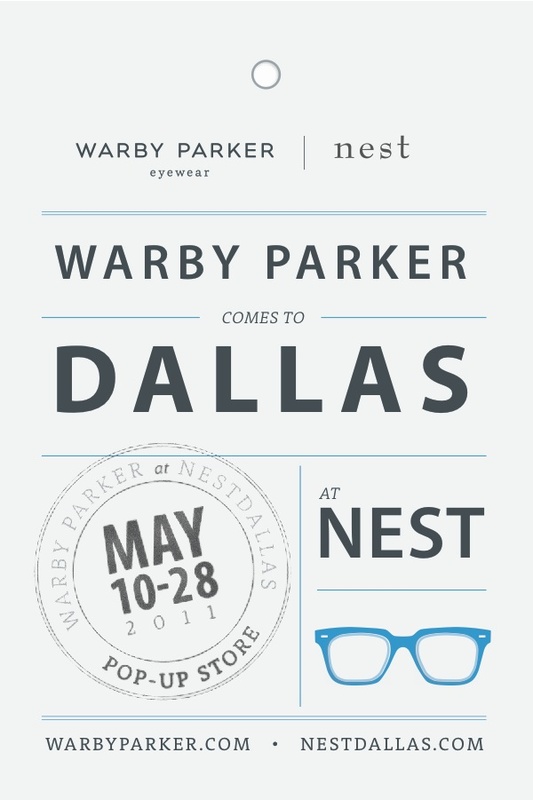 Popping in on May 10, 2011, Warby Parker eyewear will be exclusively available at the Nest for a two-week Pop- Up Shop ending on May 28, 2011. The Pop-Up Shop will feature Warby Parker’s original collection as well as its 2011 collection. The Pop-Up Shop is kicking off with a Launch Party from 6-8 p.m. on May 10. Store Hours: Monday – Saturday, 10:00 a.m. to 6:00 p.m.